On August 16th, the 5.8 Alpine Mountain Fun Institute boarded a plane and headed east to explore New York and New England. Up until now, all of our adventures have taken place west of the Mississippi, a testament to our PNW roots, but we’re always looking to expand our horizons and discover new places. This trip focused on the Adirondacks and White Mountains, two of the most famous ranges in the northeast, with no specific goals other than having maximum fun and spending maximum time in the hills. Thursday morning I flew Bend to Seattle, Seattle to Detroit, Detroit to Rochester, where my parents picked me up and drove to a pre-wedding barbeque in Pittsford, NY. We were all gathered here in upstate New York to celebrate the wedding of my eldest cousin, Emily, to her fiancé, Will. The parents had arrived earlier in the day from New Mexico and had already settled into our hotel and taken in some of the sights along the Erie Canal. The BBQ passed without incident, and wiped from a long day I travel I slept well that night. Friday morning the Kersh clan went for a run along the Erie Canal and we spent the rest of the day milling about the greater Rochester area. It was my parent’s 33rdwedding anniversary so we four went to a nice dinner together before meeting the extended family and wedding party at a local brewery. Saturday was the wedding day and we left early in the day to scope out the venue and go for a trail run in Meldon Pond park. Besides being quite humid, the morning was ideal for running, Stephen and I clicked off 8 miles up and down the muddy and rocky trails. I was very satisfied with my effort and feel like my running is finally coming around after the fateful June ankle sprain. We had lunch with my Virginia family at a delicious local bakery, then returned to the hotel to rest, iron our rumpled clothing, and get ready for the 4:30pm nuptials. Luckily, the rain held off, the ceremony was brief, and the canapés were delicious. A hearty smoked brisket supper was served after the cocktail hour, and several hours of dancing closed out the evening. The final wedding activity was a bagel brunch back at the Meldon Pond venue, Stephen had to leave soon after for the airport, and I was to catch a 2pm train back in downtown Rochester. The parents did not have to fly out until later that evening so they were able to see us off in sequential order. My train went to Albany, where my good friend David scooped me up, and we proceeded to head north toward the Adirondacks. David had several weeks off from medical school rotations and happened to be in NYC visiting his grandparents over the weekend. When we found out we would both be in New York at the same time, we decided to extend our vacation and spend a week driving around the northeast. Neither of us had ever been to the ‘dacks, so after spending Sunday night in a motel in Glens Falls, NY, we headed to an ADK mountain club store where we bought a few hiking maps and got some local beta regarding camping sites and not-to-be missed sights. Our first full morning was spent running errands, stocking the cooler, grabbing a few last-minute camping supplies, and finally arriving to our first campsite at Lake Durant State Park by early afternoon. We pitched our tent and quickly headed up the road toward Blue Lake to do a short hike up Castle Rock and an excellent view of the many islands dotting the lake. On the way back to camp, we bought $20 worth of firewood, a $17 four-pack of IPA, and spent the a couple sunny hours sitting on an old dock, catching up and watching wispy clouds drift across the Adirondack sky. Back at camp, David cooked supper, I prepared the firepit, and we enjoyed an evening of restful relaxation on the shore of Lake Durant. In the morning, we packed up all of the gear, loaded the car, and set off for the Lake Placid area by driving west and north toward the southern edge of Saranac Lake. On the way, we sauntered up to the summit of Panther Mountain, a small rock ledge with a good view of the “High Peaks” off to the east. At Saranac Lake, I rented a canoe; we paddled out to a small island, had a picnic lunch, paddled some more, and ultimately completed a 5-mile loop. I was very happy to have the experienced waterman David in the canoe because he was able to keep it straight much better than I could. Quite the trick, keeping a canoe tracking in a straight line! We took full advantage of the New York State Park system and found accommodation at MeadowbrookState Park. Lake Placid was a place I had wanted to see due to the Olympic history and proud winter sport heritage. Several of the facilities are still up from the 1980 games including the ski jumps and speed skating oval. Before supper we went to summit Mt. Jo near the Adirondack Loj. Clouds had rolled in and there was not much of a view atop mighty Jo, but it was cool to see the Loj (pronounced “lodge”) and the historic home of the Adirondack Mountain Club. Back at the campground we used the hot showers (separately) after enjoying another campfire and went to bed on the early side in preparation for the next day’s attempt of Cascade Mountain. Cascade in one of the 46 Adirondack High Peaks and is named for a seasonal waterfall that runs over the trail a quarter mile into the hike. The trail for this ascent follows a narrow path strewn with rocks and roots, to my eyes it looked like a dry riverbed, and pretty much just went up and up for nearly 3 miles and 2000 feet of elevation gain. Near the top the wind was blowing something fierce, with gusts threatening to knock me off my feet. The final jog to the summit is marked with yellow blazes on rocky slabs, which proved quite helpful as visibility was poor at this point. After a few quick pictures, we turned around and descended to the shelter of the thick timber forest surrounding the trail. The rest of the descent was uneventful and we got back to the car feeling accomplished and happy to have knocked off a High Peak before leaving the Adirondacks. Next up was a long drive to New Hampshire and the White Mountains. A car ferry was required to cross from New York into Vermont, and the afternoon brought a rainstorm that threatened to derail our evening camping plans. In Franconia notch I was pretty convinced we’d have to get another motel room based on how hard the precipitation was falling, but by the time we drove to Lincoln and scouted some potential landing spots, the rain had stopped and the Hancock campground just outside of town was calling our name. Finding a reasonably dry tent site, we set up camp and headed back out to get in a short pre-dinner hike. We gained the top of Pemigewasset Mountain and had a sweet overlook of the Franconia notch, it would have been even better if the clouds had lifted! Supper was gyros that tasted well deserved after a pretty long day scampering up two summits with a lengthy drive in between. After dark our attention turned to burning massive quantities of wood, having a lot remaining from the initial purchase a few days ago back in the ‘dacks. Thursday morning we geared up for our longest hike yet, a planned loop in the heart of the White Mountains, ticking off two peaks in the Presidential Range and spending a decent chunk of the day around 4000ft elevation. We parked at The Highland Center of Appalachian Mountain Club and started up the Crawford Path, which leads directly to Mt. Washington and is the oldest continuously used mountain trail in the United States. We climbed about 2000ft to the summit of Mt. Pierce, took a nice break and tried to stay out of the wind as much as possible. Then the sun came out and made the high traverse to the Mizpah Spring hut very enjoyable, David and I were able to shed our coats and follow the Appalachian Trail for several miles, heading south toward Mt. Jackson. The Mizpah hut is one of 8 in the range that house hikers in bunks, serve hot meals and drinks, and sell a smattering of trail supplies. After some rock slab scrambling we were atop Jackson, didn’t linger too long, and began the long descent back toward the car. At times the route down was very technical, with large rocks and roots making the footing tenuous and slow. If I learned anything about hiking in the northeast it is that the trails essentially follow riverbeds, are usually muddy, and don’t have many switchbacks. Luckily the bugs were not out in force today or any other day during our trip. I was concerned with reports of lots of bugs in these hardwoods, but for whatever reason, we did not run into anything worse than a few biting flies during our canoe outing a few days ago. After this long hike we had a picnic in a sunny meadow near where we had parked and eventually headed out to find a campsite near the town of Conway. Our first choice was booked full, but just down the road we found Blueberry Brush campground, set up the tent, and hurried off to go dunk ourselves in the Swift River just up the road from our site. After a quick, refreshing dip, we had supper in North Conway, worked on burning the last of our wood, and I tossed and turned through a restless night of chilly sleep. By Friday night we needed to be in Amherst, MA to stay with David’s younger brother Justin, take a proper shower, and sleep in a proper bed. In the morning we took a few easy walks to waterfalls in the Pinkham Notch area of the White Mountains and got on the road by 2pm. It took nearly 5 hours to get to Amherst, and upon arriving I went for a short jog to shakeout the long drive. We had leftovers with Justin and his girlfriend, Jackie, stayed up too late chatting, and hit the hay hard, appreciating the comfort of a mattress after 4 nights on the road. We all got up early Saturday morning, hit Dunkin’ Doughnuts for a classic Massachusetts breakfast, then got on the highway bound for Connecticut to return the car we had been borrowing all week. The car belongs to David’s aunt Laura, we were at her house a bit before 11am, she took us to the train station, and before I knew it we were on the commuter rail bound for Grand Central in NYC. We were going to stay at David’s grandparent’s place in Flushing, Queens, about a 45 minute commute from Manhattan. This was my second time in NYC and first time on the subway here, it’s certainly a memorable experience, being in the city and seeing the mass of humanity moving through space. The afternoon’s entertainment was the Mets v. Nationals at 4pm. After having lived in DC for several years, I am sympathetic to the Nats and was happy to see them playing a 20-minute cab ride away. We grabbed a few tickets from unauthorized resellers, let out a sigh of relief when they actually worked at the turnstile, and found our seats in the second deck above first base. The game was mostly a pitcher’s duel until the Mets hit a few solo home runs in the late innings to take the win. It was a great night for baseball and good to share another game with David, the person I have spent the most time playing and watching ball with throughout my life. As was the theme of the trip, yet another long day was in the books and by the time we got home it seemed prudent to lay low and rest as David had a 4am car pickup and I had a big day in Manhattan planned for Sunday. I woke up suddenly when I heard David putting the final things in his bag and getting ready to head out into the New York morning. We exchanged a brief see-you-later, and I stumbled back into bed until 630am. By 730am I was on the L train bound for midtown and a spot to store my luggage for the day. Dressed in running apparel and armed with my wallet and cell phone, I grabbed coffee and headed for the High Line for a morning stroll. This urban oasis is super cool and definitely a must see while in Manhattan. By the time I reached the end of the park near the Meatpacking District, I was ready to start jogging and walked west toward Chelsea Pier. This is a super popular place to run and ride; I took a lot of inspiration from all the fellow exercisers out and about, the cooling sea breeze, and rolled down to Battery Park on a endorphin high. 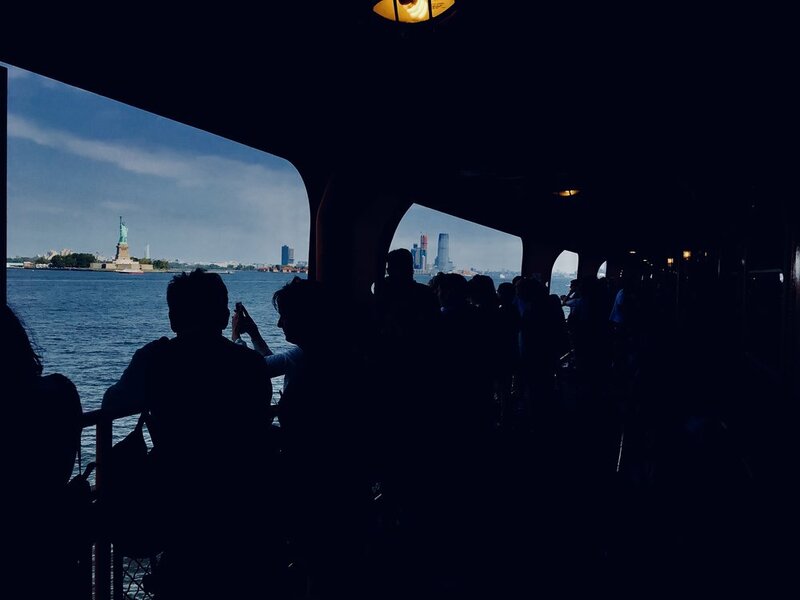 From there it was up Wall Street to go see the NYSE, then to the 9/11 Memorial Pools, and back to the Staten Island ferry for the sweet free view of the Statue of Liberty. The ferry ride was a chance to cool off, enjoy an hour of relaxing on the boat, have a snack and a cold drink, and plan my next move. I decided to go back uptown on the subway to check out the scene in Central Park; by this time it was high noon and getting pretty hot. NYC was out in force in the park and I decided to start running again, doing a short loop, then dipping into the West End and down through Hells Kitchen to claim my luggage near the Garment District. I grabbed a deli Panini to go, hustled to the bus station on 42ndstreet, and was one of the last passengers on the 1:15pm shuttle to Newark. The drive to the airport went smoothly, dropped off my big piece of luggage to be checked, put a change of clothing in my carry-on, and hungrily ate my sandwich before going through security. Unfortunately, the men’s restrooms in my departure terminal were all under construction and I had to do a spit bath and wardrobe change in a temporary bathroom stall about the size of a large porta-potty. Not ideal but much needed after sweating my way through Manhattan all morning. The flight boarded right on time and left a bit after 4pm for the nearly 6 hour flight to Portland. I have been writing this trip report for a good chunk of the flight and we are now about 30 minutes from landing back in Oregon. I have an hour layover before catching the short jump over the Cascades to Bend. I have heard the wildfire smoke I thought I’d left behind remains thick on certain days, so that is a bummer, but hopefully it will improve with the cooler temperatures in the forecast ahead. Very happy I have tomorrow off of work to catch up on things back home, do laundry, get groceries, and get started on my first assignment of graduate school at Gonzaga University. Well, ended up getting home just before 11pm, showered (finally! ), then tossed and turned in bed as my confused circadian rhythm tried to convince my body to unwind and rest. This trip was a great introduction to two famous northeast mountain ranges and I would certainly go back, especially with climbing gear, as many classic routes dot the granite slabs in both areas. Very happy to have spent so much time with David as well, with him in medical school back in New Mexico and me living here in Bend, we don’t get to see each other all that often. Some of the best moments from the trip were the insightful, often hilarious, conversations we had while hiking and sitting around the campfire. Although we were not camping deep in the backcountry, or climbing epic peaks, we made the most of our week in true 5.8 AMFI fashion and I’m super happy to have had this entire experience.